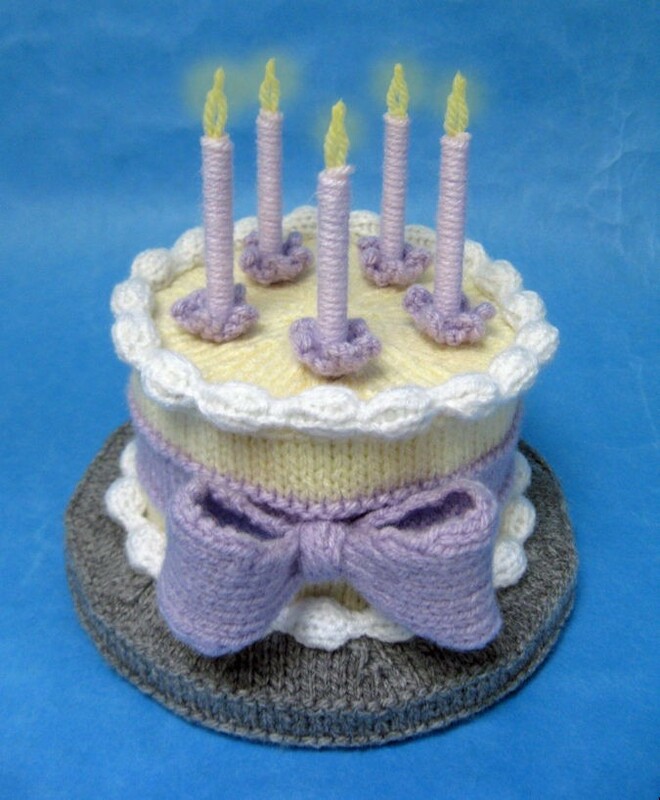 Happy birthday to you - knit, knit, hooray! Measurements: The cake, including board, is 6in (15cm) wide and 6½in (16.5cm) tall to tip of candle flames. You will need: Of Sirdar Bonus DK, 100g balls: 16g each in Aran 993, Silver Grey 838 and White 961, and 12g in Lilac 959; oddments of pale lilac and primrose DK yarns; pair of 3mm (no.11) knitting needles; a 7mm (no.2) knitting needle; 15g of washable toy stuffing; a 6in (15cm) diameter, ½in (12mm) thick, card cake board; stiff white card; plastic drinking straws; clear adhesive; double-sided sticky tape; pair of compasses; long tweezers.